1. The roundest knight at King Arthur's round table was Sir Cumference . He acquired his size from too much pi. 13. Two hats were hanging on a hat rack in the hallway. One hat said to the other, "You stay here; I'll go on a head." 15. A sign on the lawn at a drug rehab center said: "Keep off the Grass." 16. A small boy swallowed some coins and was taken to a hospital. When his grandmother telephoned to ask how he was, a nurse said, "No change yet." I bet you particularly like the littering dog one? Regarding #4, how do you confiscate someone's hand? 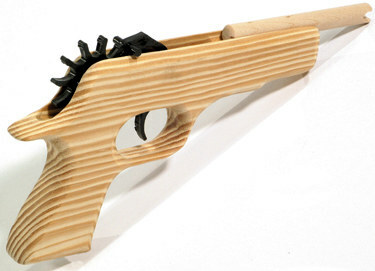 One of mankind's greatest innovations.....the rubber band gun. When I was in school, we didn't need wooden guns to fire rubber bands--we used our fingers. We would put the band on our index finger, wrap it around the thumb, and then hook it on the pinkie. Bending the pinkie would release the band with no evidence of who shot it. This reminds me of the one where the optometrist fell into the lens grinder and made a spectacle of himself. This is true. I also remember making those paper footballs and flicking them everywhere...oh the teachers just loved those. George Bernard Shaw once overheard someone describe the pun as the worst form of humor. He interjected "I disagree, poetry is verse"